What to do in the limbo between the book being out of the box, and the book being out in the world (or at least in bookshops)? It seems like a long three weeks until the official publication date of April 2 but what does that mean anyway? April 2 is Easter Monday, so in reality the book will start appearing in shops during the week prior, and in the weeks after. But what does that mean for me? It’s not like I’m going to rush out and buy a copy (because actually, I’ve already read it…). Really, I’m just on tenterhooks in limbo-land, waiting to see what, if anything, the world makes of the book. And that will probably take ages! Although Lisa over at AnzLitlovers likes it, so that’s a relief. 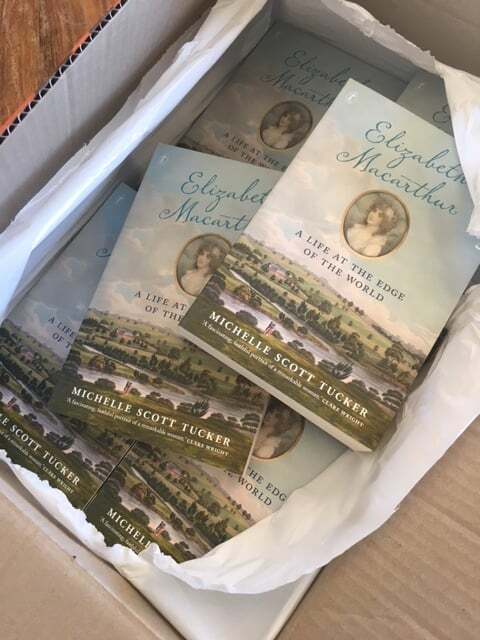 I can only wish that all the reviews of Elizabeth Macarthur are so insightful and generous. To distract myself in the meantime, I’m faffing around with publicity – visiting local bookshops, writing puff pieces about the book, and thinking about what to say during the many talks that my publicist is lining up for me. I’ve vaguely, sort of started researching and thinking about a new project but I’m finding it hard to stay focused on anything new right now. I’m also working with a graphic designer on a new website – which will include this blog. I’ve loved the look and feel of this site, but WordPress no longer supports this template and it’s getting buggy. With luck (mine) and skill (the designer’s) the new site should be up and running within the next week or so. I’m pretty sure all your existing links and bookmarks should still work, but of course please let me know if there are problems. The new site will also list all my forthcoming speaking gigs, so I’ll save discussion about them for another day. In the meantime, I think it’s probably time to eschew intellectual exertion for a while, in favour of physical effort. When that (pictured) box arrived last weekend, full of copies of my beautiful book, I felt so discombobulated that the only thing that made me feel better was to go out and slash blackberries. Perhaps my long-neglected garden/horses/dog/children/husband/bicycle/friends/cat might finally receive some attention! Early reviews are only good news if they’re good ones! Glad to see you’re already thinking about a new project. We expect (i have royal blood) to go through all the highs and lows all over again. Here’s wishing you all the very best as your amazing biography comes out into the world. And what a terrific review from ANZlitlovers! Pop the champagne…many times. That’s very kind – cheers! An awkward in-between time but one to savour I imagine. Throw yourself at those long-neglected and raise a glass to celebrate your wonderful achievement Michelle. I’m looking forward to reading it! Well, I do quite like all this glass raising business! Cheers! Stylish new blog design Michelle. I wondered why I was having to re-approve a couple of posts you’d link to of mine in the past. Am I still subscribed to this blog and if not how do I do it? I’m sorryI haven’t read you book yet – I certainly will. Meanwhile though I wish you the fest of fun over the next few weeks. I expect to hear/see you popping up all over the place.